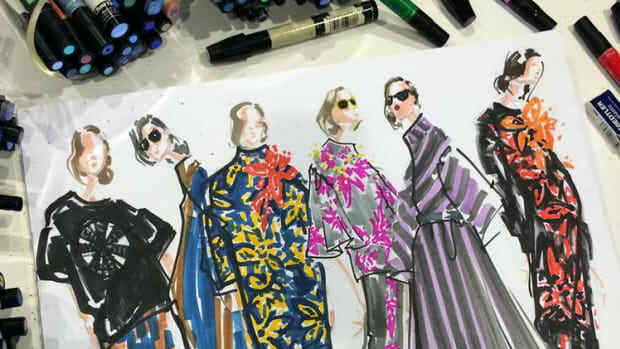 Emerging artist Katie Henderson, 30, may have been born with Down Syndrome, but that hasn&apos;t stopped her from following her passion as a fashion illustrator. Far from it. In fact, against all odds, Henderson&apos;s career has flourished ever since she first put pen to paper almost a decade ago. "You know I can&apos;t pinpoint exactly when it started," Henderson&apos;s mother, Ruth, told me. "What we discovered was, when we moved to Florida [in 2004], Katie [who had grown up in Lake Ridge, Virginia] didn&apos;t have all her friends. So at that point we called the Ability Resident Center (ARC) in St. Lucie [Florida] and Katie began going, and doing various activities there." "One day, years later [in 2008] I picked her up and they told me she had been named Artist of the Month," Ruth recalls. "We didn&apos;t even know she could draw!" It turns out that Katie had been steadfastly teaching herself to draw for years. "She&apos;s always had an interest in fashion and fashion design...you know always watching Project Runway and the Devil Wears Prada," Ruth told me. "She kept telling me she wanted to do her own design so we picked up a fashion illustration book for her to look at at the book store." "What we discovered later on was that she was taking that book and she had traced all the illustrations. I must have a good 12-15 inches of paper of just those illustrations," Ruth says. "I didn&apos;t know what she was doing, I was just getting her tracing paper and she&apos;d go into her room and do her own thing." Once Katie had mastered tracing the designs, she began drawing freehand. Shortly after that, she completed three watercolors of posing models at the ARC--the work that lead to her being named Artist of the Month and brought her talent to the attention of her parents. After that, Ruth did everything she could to help Katie grow and expand her artistic talent. She bought her sketchbooks and colored pencils and enrolled her in an art group. "The art instructor he kept trying to get Katie to do landscapes, but she just wouldn&apos;t," Ruth says. "She only wanted to draw fashion." And so they went with it. "Eventually it got to the point...Katie wanted to have a business. She always wanted to be an entrepreneur," Ruth said, adding with a laugh, "She came to her dad and told him to be an entrepreneur and give her some money!" When the National Special Olympics Golf Tournament offered to let Katie sell her merchandise, which, at that point involved silk-screened t-shirts of her illustrations, the Hendersons found themselves at a crossroads: They wanted to agree to the opportunity, but doing so would mean spending time and money. They weren&apos;t sure how to proceed--until a lucky break (or divine intervention) came along. "I bought a raffle ticket from the church and told Katie that if I won I would put it into her company," Ruth said. "The weekend that we had to decide [whether or not to sell at the National Special Olympics Golf Tournament], I got a phone call and was told that we won the raffle and won $5,000!" Thanks to that raffle money, Katie was able to get everything she needed to get her business off the ground. The family officially registered the company as Miss Katie&apos;s Kreations in September 2011, and interest in Katie&apos;s art has quickly snowballed, leading the young entrepreneur to focus on selling standalone prints rather than t-shirts. In February 2012, Katie had her first gallery exhibit "Empowering Women," where she sold one of her original illustrations for $1000. She has had several original drawings purchased by private collectors in Pennsylvania, Ohio, Indiana, West Virginia, Florida, and Texas and has even opened up her own gallery/studio space Café Katie Gallery, located at Art Bank Loft #308 in Ft. Pierce, FL. She&apos;s won praise from art lovers and critics alike, and some have even likened her work to that of Picasso&apos;s.
As Katie&apos;s career has grown, so has her confidence. "The past few years, I&apos;ve seen her blossom, she has more self-confidence," Ruth said. "I see an ease in her when she speaks to people. When she&apos;s at the gallery, she walks around with a business card, and she meets and greets people." Katie&apos;s ambitions have grown too. She now dreams of seeing her "designs come to life," and hopes that one day her clothing will even be featured in a magazine. (Vogue, we hope you&apos;re listening!) She&apos;s currently working with Lynne Barletta at the Visionary School of Arts in Stuart, VA to work towards her goal--Ruth says they have a "unique connection"--and has even created a few original garments (including one in the above photo) with the help of Ruth on the sewing machine. But besides being a talented and inspiring artist, Katie is also a generous and hard-working philanthropist. She frequently donates prints and originals to fundraising events, and is currently raising funds to support The Treasure Coast Down Syndrome Awareness Group (Stand Up for Independence). Most recently, Katie exhibited her work at the National Down Syndrome Congress Convention held in Washington, DC. "You know, I remember, I used to go to those conferences looking for guidance, and support, when Katie was young. I was looking for answers," Ruth said. "And so now, to be able to go, and see Katie there, showing her work, and to see it give hope and inspiration to others...that was really special." "When Katie was first born everybody came in with the really bad stuff--you know, &apos;she&apos;s not going to live past 36 hours,&apos; and that kind of stuff but my philosophy has been to never give up," Ruth says. "Katie keeps telling me she&apos;s not a little girl, she&apos;s a woman. She&apos;s trying to teach us to let her go. So I think it&apos;s important for any parent, whether their child has a disability or not, to give them some of the tools so they can blossom and do what they want to do." "As long as she&apos;s happy and she&apos;s enjoying herself, that&apos;s all that matters." Click through to see images of Katie&apos;s work. You can buy a print of Katie&apos;s work at her website misskatieskreations.com. Step one: Get lots of Instagram followers.